There will be a new player award up for grabs at the end of the season. The Premier League Playmaker award will be presented to the Premier League player to have provided the most assists in the season. It will join the Premier League's prestigious season awards of the Golden Boot, to the top goalscorer, and Golden Glove, to the goalkeeper with the most clean sheets. Kevin De Bruyne currently leads the race for the 2017/18 Premier League Playmaker award. The Manchester City midfielder has 15 assists. He is followed by team-mates, Leroy Sane (12 assists) and David Silva (11). But, with most of the leading candidates having at least four more matches to play this season, it is still possible for a late charge by someone to claim the award in May. The three awards are presented by Cadbury, the official snack partner of the Premier League. 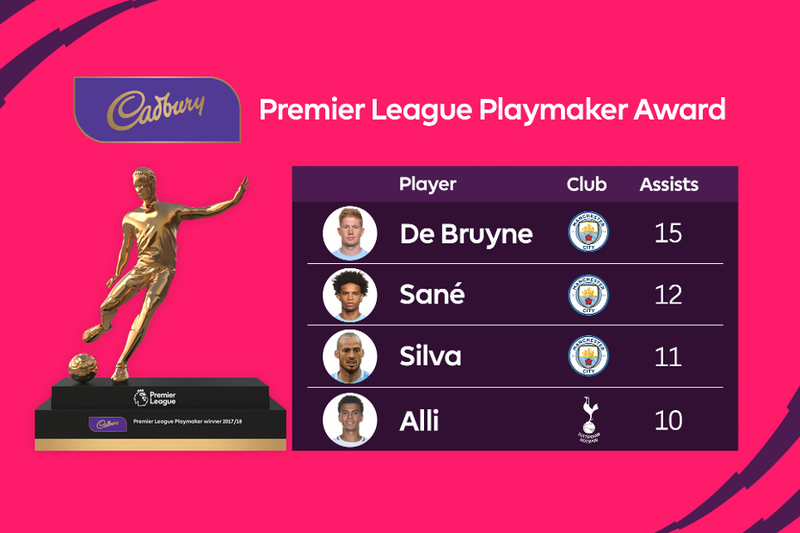 Cadbury is offering one lucky fan in the UK the chance to present the Playmaker award to the winning player at the end of the 2017/18 campaign. All fans in the UK need to do is go to the official Cadbury UK Facebook page and comment on the post about the award with #Playmaker and their favourite team between 18-24 April 2018 to enter the prize draw. Terms and conditions apply. "The Premier League Playmaker award allows fans to celebrate their footballing heroes who work hard for their team by providing goalscoring opportunities," Richard Masters, Managing Director, Premier League, said. "Giving supporters the opportunity to present this new accolade, as well as the Golden Boot and Golden Glove awards, is a great way in which Cadbury are working with us to celebrate key achievements in the competition." Francesco Vitrano, Cadbury Brand Director, was pleased to work with the Premier League to introduce the award. "We feel this award is important as it recognises and rewards the generosity and teamwork needed to score those all-important goals," Vitrano said. "Additionally, being able to give one lucky person the chance to present the award through our competition is a great way to celebrate another very important part of football – the fans."